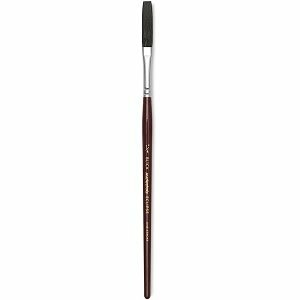 Brush-Blick Masterstroke Eclipse One-Stroke, 1/4"
Home / School, Art, & Office Supplies / Art Supplies / Brush-Blick Masterstroke Eclipse One-Stroke, 1/4"
Extra-long shape holds a larger load of color, and the square end delivers a sharp edge. Nickel-plated seamless ferrules, short black lacquered handles. Bristles are 1/4" wide and 1-1/4" long.